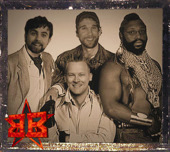 BBLiveShow is a live Internet stream that bills itself as the "best worst show on the Internet". It is the brainchild of Brian Brushwood who sometimes refers to himself as "a toddler beating on a drum". The show usually consists of Brian interacting with his co-hosts, the chat room, and occasional callers. Episodes start out with a topic of discussion, but often evolve into something else. Regular topics include a Viral Video Smackdown and Adobeshop Contest. Recordings are made of each episode and are available as a podcast. The "after show" that follows the live broadcast is not included in the podcast. Many fans feel that this is sometimes the best part of the show. BBLiveShow was first broadcast on Ustream on January 1, 2009 and was called "BBShowLive". The show was available erratically at first. Eventually, it moved to a regular broadcast day and time with occasional weeks skipped when Brian is touring and Internet is unreliable. On November 24, 2009, it was succeeded by NSFW. For a short period of time, the BBLiveShow web site even redirected to the NSFW site. With the addition of NSFW to the TWiT Netcast Network, BBLiveShow was broadcast much less frequently and has not had an official broadcast since January 10th, 2012. BBLiveShow.com is now mostly used to house archives of the show. However, it also played host to the live final episode of the first season of FSL Tonight. BBLiveShow episodes can still be found on iTunes and are hosted by Adequate.com. This page was last modified on 2 July 2016, at 13:44. This page has been accessed 36,346 times.